A freshly-cooked pot of Jeff’s Diabetic-Friendly Jambalaya. 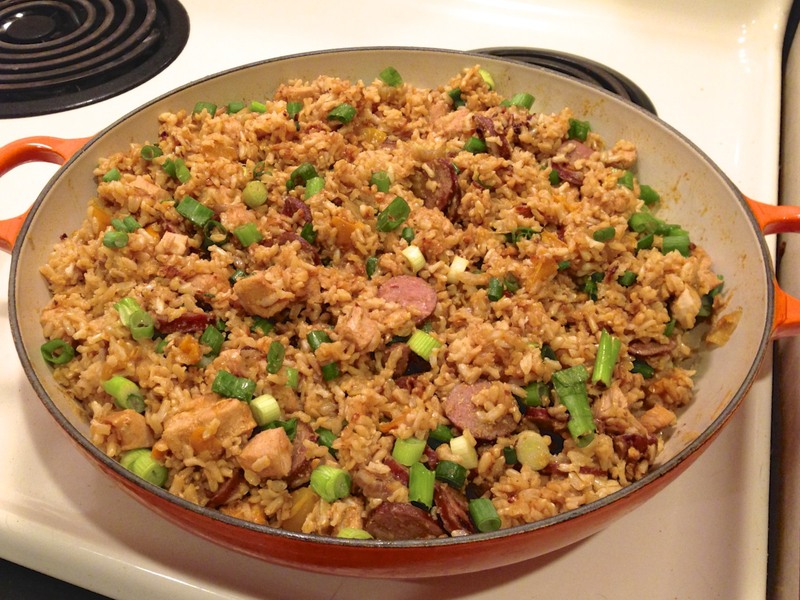 I suppose my friends and family would call jambalaya my “signature dish.” I’ve been making it ever since my first trip to New Orleans (many years ago) and it started out as a recipe from Emeril Lagasse’s New Orleans: Real And Rustic. Before my first trip to NOLA, my idea of cooking was to add a slice of processed cheese food on top of a microwave burrito! But after that life-altering excursion, and finding Emeril Live! on FoodNetwork, I began to realize that cooking was fun, and I could actually bring back some of my creole and cajun favorites to Wisconsin. My gumbos and etoufees are straight out of the pages of Emeril and Mulates, but my jambalaya, which I make very often for myself and others, has evolved. This recipe is modified from the one I have been making for years. Since my diagnosis as a diabetic, I’ve been playing with the recipe to change out elements to make it more diabetic-friendly and also healthier. After several trials, this is what I’ve settled on, and it’s turned out fantastic in terms of taste but also much better than I had hoped in terms of nutrition and blood glucose impact. In a large, heavy, wide vessel (I use a Le Crucet 5-quart braiser), heat the oil over medium heat. Add the onion, green pepper, salt and cayenne. Stir initially to coat, and then occasionally until onions are translucent (about 3-5 minutes). Scrape the bottom of the pot as necessary. Add the sausage. Stir occasionally and cook until heated through (about 5-7 minutes). Scrape the bottom of the pot as necessary. Season the chicken with the spice rub, then add to the pot along with the bay leaves. Stir occasionally until chicken is cooked through, barely brown (about 5-7 minutes). Scrape the bottom of the pot as necessary. Add in the brown rice. Stir to coat, and then occasionally for 2 minutes, so that rice is well incorporated. Add the water. Stir initially, scraping the bottom of the pot one last time. Then cover and cook for 1 hour 10 minutes. Do not remove cover or stir during this time — just let it go. Keeping the pot covered, move off heat and let rest for another 40 minutes. Again, do not remove cover during this time. It’ll be ok — you’ll see! Uncover and stir in the green onions. Yields over 4 lbs total, which is 4-6 servings if standing alone as the entire meal, or 8 servings if served as a side dish. Shown in the photo is 1/8 of the pot on a small plate with a small fork. Scaling note: If you double this recipe, it will fill up a large crock pot to the brim for transport to your next potluck. I make a single batch in two vessels when I do this; in the past, when I’ve made this with white rice (half the covered cooking time and resting time, but four times the cooking oil and not diabetic-friendly or nutritious) making a double batch in one large pot caused the rice to break down more than I’d like.